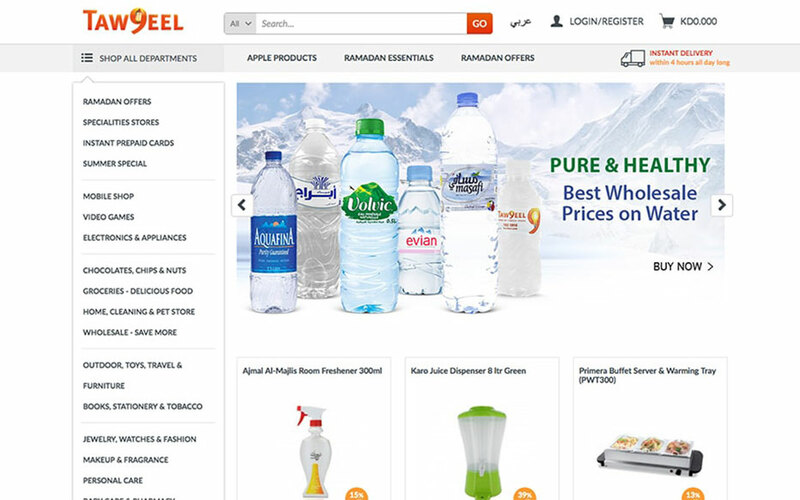 Taw9eel.com (Tawseel) is the largest online retailer in Kuwait, selling wide variety of goods; from groceries, jewelry, perfumes and pharmaceuticals, all the way to video games, smartphones, tv’s and kitchen appliances. With their free delivery within 4 hours, they sure beat the clock with the fastest buy-to-delivery time in the world. No surprise that “tawseel” is the word for delivery in Arabic language! Taw9eel company approached us back in 2012, asking for a revamp of Sheeel website, owned by Taw9eel. It turned out to be a complete success which resulted in expanding the cooperation and completing three more success stories with this partner: Digumz, Berwaz, and Thouqi. In the meantime, we jumped into the maintenance of taw9eel.com, their flagship eCommerce website. Working with Taw9eel has been both exciting and interesting. Our longtime collaboration has given us enough space to develop custom features and focus on what’s really important for our client. 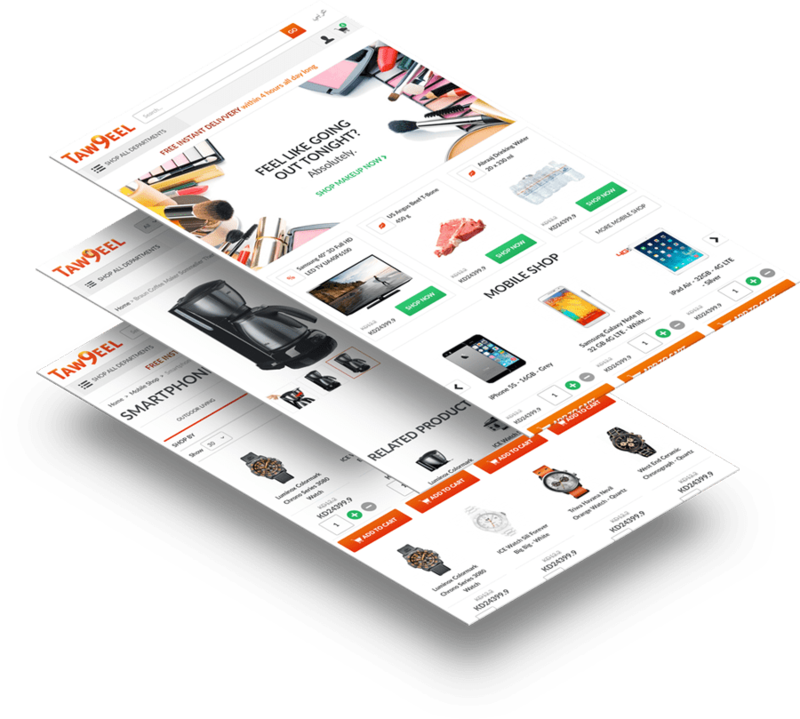 In order to get the desired site, we had to implement custom design and code, which resulted in an unique eCommerce site. Merchant Marketplace is one of the most important and most used features working seamlessly on Taw9eel. It allows merchants to access a dashboard where they can register, see how much they sold (both coupons and physical products!) and where they can easily track their income via various graphs. On top of that, merchants have the option of receiving SMS notifications after something has been sold on their marketplace – if they validate their phone number! We also created Widgentic – tool which enables administrators to change the frontend design without actually knowing how to code. It goes along nicely with custom integration of Magento and Mailchimp. First one enable dynamic publishing of the content, second one enables administrators to generate autonewsletter campaigns in Magento. When it comes to content, it is also important to note integration of the Solr search. That way the search bar became more efficient and maximised the user experience. Auto checker, autocomplete and autocorrect enable users to find their answers faster, and custom layer navigation (multiple select with color switchers) enables user to find their products faster. Considering the fact that our client is from Kuwait, it was important to create custom, right to left template in Arabic. We went on to customise both the template and the way Magento generates PDF receipts. Among other custom changes we should also mention synchronising Taw9eel catalog with ERP. In this specific case, we worked on synchronising stock, as well as the prices, with ERP in real time. We also did a custom integration of payment gateways for Kuwait, such as KNET and MiGS.